This post, we pick up on the food groups, looking at dairy, protein, and oils. Dairy is a full-fat example of this. In Middle English, the word dairy took the form deierie, joining dey (among other forms) and the suffix –ery. Dey first referred to a “female servant.” Later, it meant a “farm servant” and “dairymaid.” The suffix -ery can denote the place of a particular activity, Here, a dairy was originally the room or building “for treating milk and its products” (Oxford Dictionary of English Etymology [ODEE]). Think bakery or laundry for some –ery comparisons. There is much to unpack in terms of the historic constructions of women and work implied in dey, but, on an etymological level, what’s going? Human tongues have shaped some other fascinating forms out of this *dheigh, but we’ll save them for next post. Protein: the building blocks of life and, as a coinage, an example of one of the building blocks of etymology. In an 1838 article in Bulletin des sciences physiques et naturelles en neerlande, Dutch scientist Gerhard Johan Mulder uses a French formation, protéine, to describe the composition of some organic substances. Apparently, this word was the suggestion of Jöns Jacob Berzelius, the accomplished Swedish chemist, who is also given credit for polymer and catalysis, among other terms. So, why protéine? At root is the Greek proteios, “of the first quality,” joining protos (“first”) and the -eios suffix. It was so named as a “primary substance…of material bodies of animals and plants” (Oxford English Dictionary). Proto- is a member of the big family headed by the Proto-Indo-European *per-, which came to mean everything from “through” and “around” to “before” and “first.” Per-, peri-, para-, and pro- may all be familiar prefixes derived from it. They are still productive today. 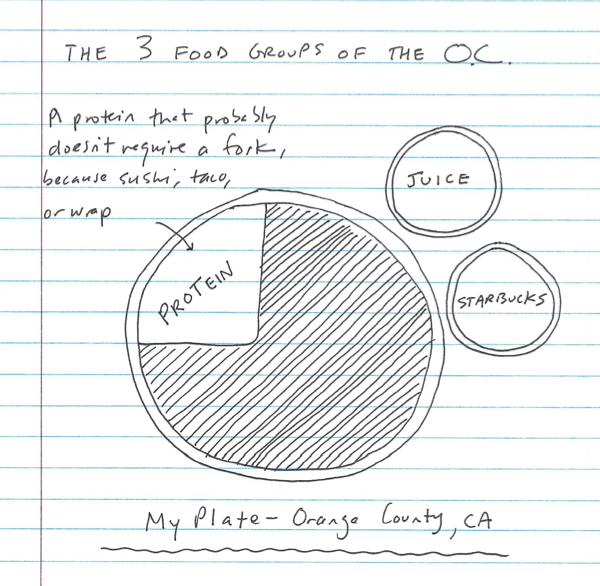 Our understanding of protein has evolved, to be sure, for now protein is considered one of the three food groups in Orange County, CA. The others being, of course, juice (i.e., blended juices and smoothies) and Starbucks. Doodle by me. Click to enlarge. Health advice aside, even etymology is urging you to use olive oil as your cooking oil. For oil, etymologically, is olive oil. Oil, whose historic spellings are more varied than your choices of olive oil at the grocery store, is from the Old and Middle French oile, pressed from the Latin oleum. It referred to “oil,” thus “olive oil.” Old English had ele, a cognate of oil, but Germanic languages jumped on the Latin oleum food craze, and a new brand, if you will, made it into the pantry. The Latin oil goes further back to the Greek elaion, the “olive tree” or “olive.” The Romans took elaion up as oliva, hence olive. The Online Etymology Dictionary speculates that the Greek root might be related to the Armenian ewi, “oil,” adopted into Greek from Aegean or Cretan tonuges. Aremenian is indeed an Indo-European language with some kinship to Ancient Greek. Wiktionary seconds this ewi cognate, adding the Old Church Slavonic’s loi, “tallow,” and posits a Proto-Indo-European *loiwom. Petroleum is literally “rock oil,” joining the Latin petra (rock, via Greek) and oleum (as discussed above). Shipley observes that petroleum was “first extracted from fissures in rock.” Margarine is short for oleomargarine. The oleo- refers to “oil,” of course, and the margarine refers to “margaric acid,” named from the Greek margarites, “pearly,” for the acid’s crystal’s “pearly lustre” (ODEE). And now you know why a Margaret is so named. Next post, we’ll pick up on *dheigh, including the surprising origins of lady and lord. The new food pyramid, courtesy of http://www.choosemyplate.gov. I think they have something against knives and spoons. What can I say? Some people can’t resist chocolate. I can’t resist a good info-graphic by an under-appreciated department of federal government. Conventionally, we speak of five food groups: fruits, vegetables, grains, protein, and dairy. Fats, oils, and sweets–which I now often see treated together as “oils”–function as a sixth category. So, besides from the ground, where do “fruit,” “vegetable,” and “grains” come from? Distinguishing between fruits and vegetables can be as spiky as a pineapple rind. Slate‘s Lexicon Valley episode “Legislating Language” will entertain and edify you with a story about a court case where this distinction truly mattered. If you don’t like to eat your vegetables, perhaps etymology will inspire your appetite. The Middle French vegetable dished English up its serving, from the post-classical Latin vegetabilis, an adjective that meant “animating” or “vivifying.” This life-giver is a very far cry from its pejorative use today to describe a person with brain damage. If we dig deeper into the Latin soil, we will find vegetare, “to invigorate,” and vegetus, “lively, energetic.” Here, the Proto-Indo-European base is *weg-, “to be strong,” ultimately giving English wake, watch, and wax through Germanic seeds and vigil, vigor, and velocity through Latin ones. Surveillance is a French take on Latin’s vigil. Mothers wear many hats: they are caregivers, breadwinners, and…etymologists: Eat your vegetables indeed, they will literally make you strong. The source of grain is the same as corn. American English restricts corn to “maize,” but it still can refer to cereal grains in British English. We can trace grain back through Old French to the Latin granum (think granule) and corn to Germanic root *kurnom or *kurnam. At some point, the Romanic and Germanic forms converge on the Proto-Indo-European *ger-. Jordan Shipley glosses this as “ripen” (from an earlier meaning of “grow old”) while the Oxford English Dictionary focuses on the Sanskrit cognate jr, “to wear down” or “waste away.” If the OED is correct, we may think of grains in reference to agriculture: a “worn down” particle, as the OED comments. For me, a good word origin is like discovering an Easter egg, hidden in plain sight yet holding a sweet surprise inside. What surprise might the word Easter hold in its shell? Any hunt for the origin of Easter points back to the Venerable Bede (~672-735). He was an English monk, scholar, and translator. Perhaps his greatest legacy is his Ecclesiastical History of the English People, a critical and primary source of knowledge on Anglo-Saxon history. Inter alia, his work did much to elevate the English language as a vehicle of scholarship. The opening of Bede’s “De Temporum Ratione.” Image courtesy of the University of Glasgow. According to Bede, Eostre was an Anglo-Saxon goddess whose festival was celebrated at the vernal equinox. The problem, though, is that we can’t find confirmation of this pagan Eostre elsewhere. But as the Oxford English Dictionary asks, why would Bede invent a god to account for Christian one? Only German and English use “Easter” to name the Christian festival. European languages–including manyScandinavian ones–use terms derived from Jewish Passover, such as Pascha. You may recognize this in the derivative paschal. This passed into Romance languages from the Latin, before that Greek and Aramaic, and ultimately from the Hebrew, pésakh (or pesah). The root–the triconsonantal root, if you’re familiar with Semitic verb structures–is p-s-ḥ (פסח) and means, in essence, “to pass over”–to jump, to skip (Wiktionary). 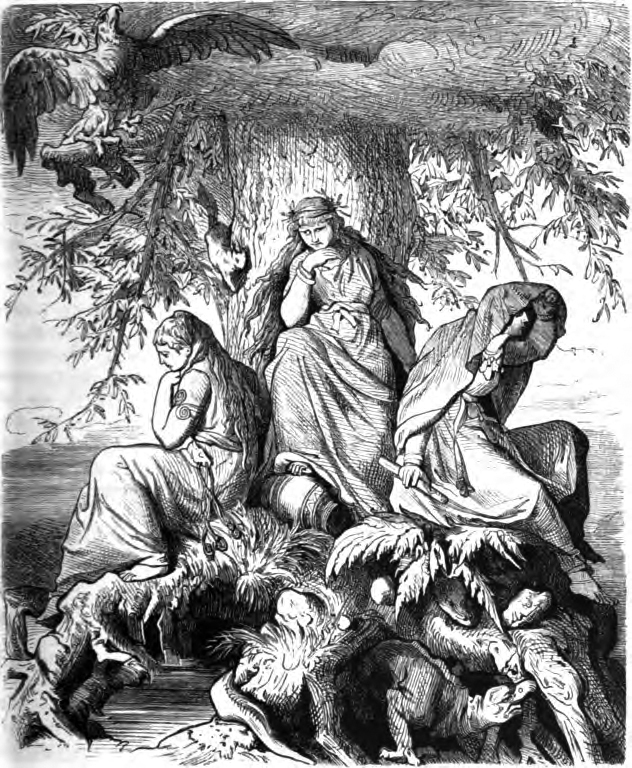 Nevertheless, Jacob Grimm–whose impressive and influential career included a comprehensive dictionary of the German language; groundbreaking linguistic research, including his formulation of Grimm’s law; and editing what we refer to as Grimm’s Fairy Tales–puts a lot of eggs in the basket of a Proto-Indo-European goddess of the dawn, *Ostara. He based much of argument on the grounds of linguistic reconstruction and etymological cognates. While *Ostara is dubious yet possible, Grimm’s hunt doesn’t exactly turn up empty-basketed. For, the Easter cognates point back to a Proto-Germanic *austra-, source of the English east (as in the direction), and further back to Proto-Indo-European *aus–, “to shine” or “clear” and “bright.” They live on in words like Australia, aurora, and the chemical symbol for gold, Au (from aurum), all from Latin iterations. We see, then, at root of Easter, a shining sunrise in the east. For the Easter believers, this Eostre was goddess of spring, of dawn, of fertility, whose festival was celebrated at the vernal equinox. New beginnings: That’s what all the Easter symbolism–Christian or pagan–is about, isn’t? With its old root, Easter preserves a new dawn, literal and symbolic. The custom of April Fools’ Day has been traced to changes in calendars, Roman festivals, and that spring spirit in the air. Finding the true origin of April Fools’ Day may well be a fool’s errand, but what do we know about the origin of the word fool? It turns out its etymology is up to a bit of tomfoolery of its own. The principal senses–”bag” and “sack”–explain English words like follicle. Follis had a diminutive form, folliculus, which is more directly behind this follicle. But it’s the windier meanings like “bellows” or “puffed-out cheeks” that suggest the jump to fool. Walter Skeat focuses on folles, the plural form of follis: “puffed cheeks,” he writes, “whence the term was easily transferred to a vain or foolish person.” OK. Perhaps the connection isn’t quite so transparent, Walter. Ernest Weekley gets a little more colorful, shall we say, in his etymology, which focuses on a different kind of sack and ball. He, too, notes the senses of “bellows” and “windbag” in Latin, but proposes a more specific sense of “scrotum.” First bracket and codpiece, now fool and scrotum? For this, he cites by way of analogy the Italian coglione, meaning “fool” and “little testicle,” as well as Latin, gerro, “fool,” Sicilian for “pudendum.” As far as my research goes, Weekley is alone in this etymology. Have you ever made faces at a baby? Say, puffed out your cheeks, trilled your lips, blew out the air? I suppose we’ve all played the fool. Literally. And we’ve all been played by the fool–the wise fool, speaking of court jesters. Old English, too, had wod, which replaced “mad” in meaning and form. (I covered mad recently, too, if you’d like to learn more.) It may well derive from the Proto-Indo-European *wet-, “to blow” but also “to inspire.” It has come interesting cognates: the Old Norse oðr (related to the name of the god Odin), “poetry”; Old Irish faith, “poet”; and the Latin, vates, “prophet, seer” (Vatican is not related). We might remember, too, Latin’s afflatus, referring to a state of divine inspiration, literally, “blown upon,” featuring that same Proto-Indo-European root, *bhel-. The ramblings of madmen, prophets–the Old Testament had some lessons about this, right? Pity the fool? Perhaps more like pay attention to the fool.